This entry was posted in Day in Sentence, Homepage, Slice of Life and tagged dayinasentence, slice of life challenge. Bookmark the permalink. I love this idea of “boiling” a day or a week into a single sentence. Something to ponder and see if I can accomplish that feat. Thanks for sharing your sentences. I was off line for 24 hours. Weird. I’m starting to think in 140 characters – too much Twittering?! 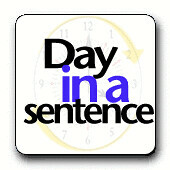 I really like the idea of distilling a day into a sentence. I joined Bonnie’s informal challenge … it’ll be nice to try continuing that exercise.